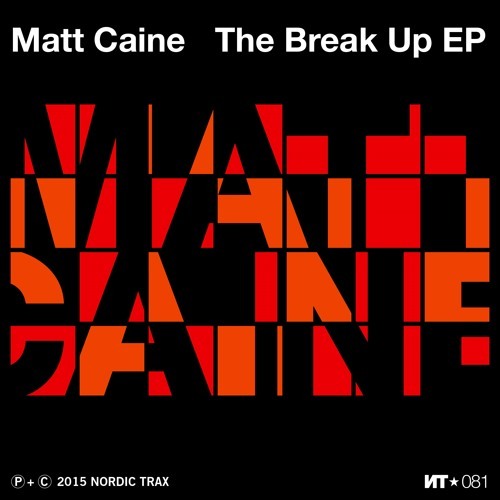 ARTIST Matt Caine TITLE The Break Up EP CAT# NT081 STYLE Deep House, Tech House :::::::::::::::::::::::::::::::::::::::::: Upfront support from Dubfire, Omid 16b, Demarkus Lewis, Gene Farris, AME, Shur-I-Kan, Halo, Anthony Pappa, Perel, Stacey Pullen, Nick Warren, Mr. V, Nacho Marco, Mike Grant, Brett Johnson, Robbie Akbal, Jem Haynes, Richy Ahmed, Rui Da Silva, Paolo Mojo, Chris Udoh, Mark Farina, Kiko Navarro, Matthias Kammel, Black Girl / White Girl, Advokkat, Jon Delerious, Isis Graham, Trevor Walker, DJ Krown, Warren Sauvage, Kajan Chow, Untitled Music, Samuel Bailey (Radio 1), Soundspace, Strictly Underground & more. :::::::::::::::::::::::::::::::::::::::::: Rising Canadian producer Matt Caine makes his Nordic Trax solo debut with The Break Up EP. The diverse five-track release moves from peak-time big room house to moody tech-infused deep trax. Fans of the label will know Matt’s work from his appearance on Jon Delerious’ ‘Tree Line EP’ [NT077, released June 2014] and supported by Tensnake, Deep House Amsterdam, Halo (H-Foundation), Sei-A, Mark Farina and many more. On The Break Up Matt steps into his own with an accomplished release built around solid drum programming, lovely melodies and some very catchy hooks. The last twelve months have been a break-out year for Matt. His Crime Boss EP on Calgary’s Substation Recordings reached high in the Beatport Deep House charts and was championed by the likes of Pezzner, Atnarko & Isis Graham. This March he released The Elevate EP on Omid/16b’s Alola Records, which cross- pollinated genres and simultaneously pushed up Beatport’s Deep House, Indie Dance / Nu Disco & Tech House charts alongside dj support from Nick Warren, Dale Middleton and Shur-I-Kan to name a few. An accomplished dj and veteran of the Calgary nightlife scene, Matt is a resident at Habitat Living Sound where he has hosted the likes of Jimpster, Fred Everything, Inland Knights, Chuck Love and Luke McKeehan among others. :::::::::::::::::::::::::::::::::::::::::: The Break Up EP is out June 16, 2015 everywhere. All tracks written & produced by Matt Caine. All songs published by Nordic Trax (Socan).